Provide comfort for the family of Doris Johnson with a meaningful gesture of sympathy. 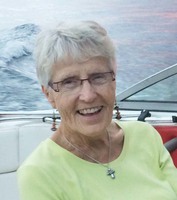 Doris Ann Johnson, 82, of Arnolds Park, Iowa passed away on Thursday, April 4, 2019 at Lakes Regional Health Care in Spirit Lake, Iowa following a courageous battle with cancer. A Celebration of Life Service will take place at 11:00 a.m. on Tuesday, April 9, 2019 at Immanuel Lutheran Church in Spirit Lake, Iowa. Rev. David Simonson will officiate. Burial will take place at a later date at the Lakeview Cemetery in Spirit Lake, Iowa. Visitation will begin at 10:00 a.m. on Tuesday prior to the service at the church. .
Doris was born August 7, 1936 in Lake Park, IA in the home of her great aunt Alvina to Edward and Lucy (Spring) Fischer. She was baptized and confirmed at Trinity Lutheran Church in Sioux Valley. She attended Sioux Valley School and graduated in 1954. Doris worked as a telephone operator in Jackson, MN following graduation. On Sept. 9, 1956, Doris married Duane Johnson at Trinity Lutheran in Sioux Valley. They made their home in Sioux City for three years before moving to Spencer, Terril, Storm Lake, Estherville, Spirit Lake, and Arnolds Park over the years. In 1969, Doris and Duane opened the Villager Restaurant in Estherville. Together they owned and operated the business and added a second business, Lakes Vending, in 1973. For over forty years they owned and operated the company, moving it to Spirit Lake in 1993. Doris was very active in her church and community. She volunteered in many capacities over many years. In everything she did, she was a faithful witness for Christ. She was a loving Mother, Wife, and Friend to many. Doris enjoyed family gatherings and bringing people together. She had a unique way of making others feel welcome and important. Nothing brought her more joy than attending and supporting each of her grandchildren’s activities. She appreciated each of their individual talents and gifts and pointed them all toward the Lord. She will be forever cherished by Duane, her husband of 63 years; her children, Diane Johnson of Spencer, IA, Dan (Seiko) Johnson of Carlsbad, CA, David Johnson of Dallas, TX, and Debbie (Aaron) Albright of Milford, IA; grandchildren, Edward Johnson, Christopher (Faith) Albright, Olivia Albright, Maddie Sims, and Ethan Albright; great grandchildren, Aspen and Eden Albright; a sister, Doloris (Al) Fastrup of Spirit Lake, IA; a sister-in-law, Mavis Johnson of Hartley, IA; along with several nieces and nephews. Preceding Doris in death were her parents; infant triplet daughters, Dawn, Denise and Debra and infant son, Timothy. Memorials in Doris’ name may be directed to Immanuel Lutheran Preschool in Spirit Lake for families and scholarships. To send flowers in memory of Doris Ann Johnson (Fischer), please visit our Heartfelt Sympathies Store. Provide comfort for the family of Doris Ann Johnson (Fischer) by sending flowers. Heartfelt Sympathies Store purchased flowers for the family of Doris Johnson.